Chronicling 14 years of art & literature together, and showcasing the new interactive capabilities of Adobe’s flagship publishing software. 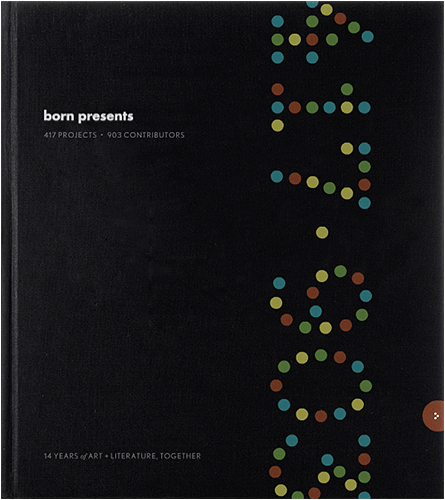 Born has brought together hundreds of poets, designers, programmers, musicians and others to create an unprecedented history of creative collaborative arts on the Web and beyond. This retrospective is a preview of Born’s developing multimedia/book project that showcases the creativity and talents of those who have conceived some of its most inspiring work. The project was originally conceived as a printed book, but with the dynamic nature of the content the concept quickly evolved. Questions such as “What could an interactive book look like?” were asked (although not always answered definitively due to the limited scope of the book preview). The design language evokes the aesthetic of printed pieces but the piece seamlessly weaves in interactivity, animation and multimedia elements. The book preview was created in partnership with Adobe as a showcase for the new interactive capabilities of InDesign CS5. The project was a featured Customer Story on the Adobe site, as well as the focus of an Adobe Success Story.